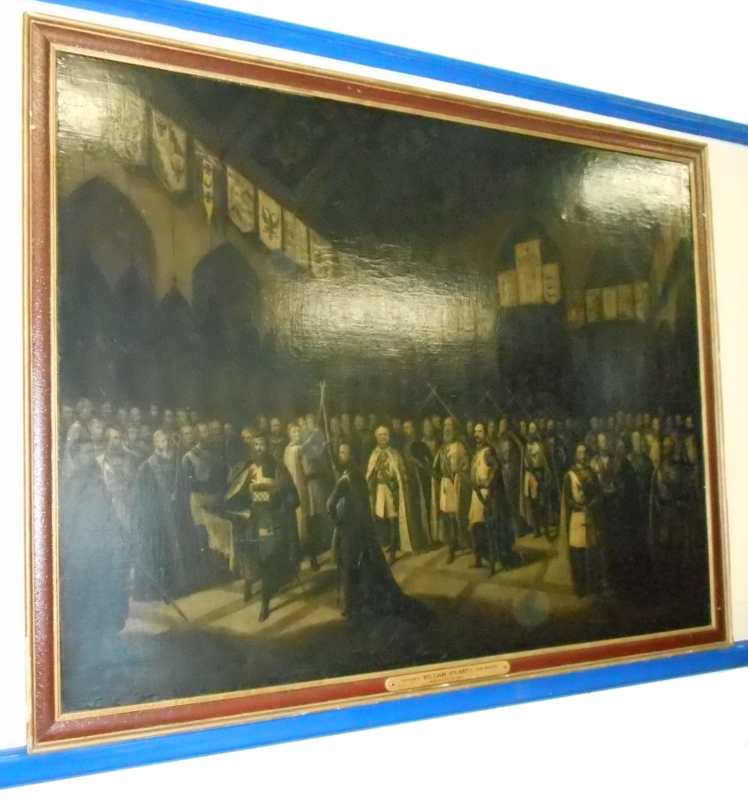 When Stuart Preceptory No.28 was approaching it’s 150th anniversary a large painting was found in the basement of Halsey Hall, Watford. It was almost black but a brass plate on it stated it depicted the Installation of William Stuart as Grand Master In 1861. Although in a very dirty state, it can be seen that the painting contains images not just of Knights, but also of horses, armour and banners. This painting was placed on the stage (now removed) in the dining room at the 150th Anniversary Meeting. Stuart Preceptory being the founding Preceptory in the Province (and in fact being the Province from 1840 until it’s reconstitution in 1933) and William Stuart being it’s Founding Preceptor, it is probably the most important Knight Templar artefact in Hertfordshire, (further information can be found in the history of the Province published on the Provincial web site) and it has been the wish of members of the Stuart Preceptory, ever since the painting was discovered, to have it restored. It’s importance within the Province is also recognised by the Board Members at Halsey Hall as it has now been hung on the wall in the back Temple. When Kt. Steve Batty was Installed as the Eminent Preceptor in October 2015 he was determined to raise awareness of the painting and to commence some fund raising for the cost of restoring it. This is likely to be in excess of £3000 , a not inconsiderable sum, but well worth raising considering the importance of the painting. At his Installation Steve launched the fund by holding a raffle (which has also been held at every meeting during his year), and donating some regalia to be sold, with the proceeds being donated to the fund. It is hoped that other Preceptories within the Province will recognise the importance of the painting and support Stuart Preceptory’s efforts to raise the money to have it restored. Considering it’s historical importance, it would be good for it to be a project embraced by the Province as a whole, and not just left to Stuart Preceptory. Bro. 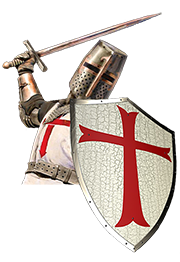 Knights and Preceptories of the Province of Hertfordshire, you can help fund this important restoration by sending contributions ( made payable to “Stuart Preceptory No.28) to the Preceptory Registrar.